Have you ever wondered where many of the place names displayed on road signs originated? 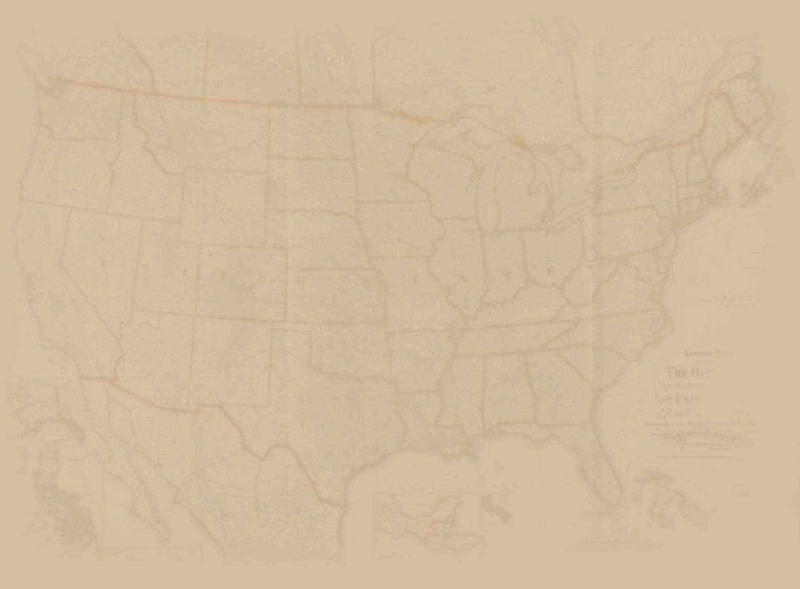 Was a city, town, or historical site named for a founding father, a geographical feature, historical event, or something else that brought this area into prominence? Names tell a story and the story is not always obvious. A visit to Blowing Rock, North Carolina taught me that a name can have several meanings. 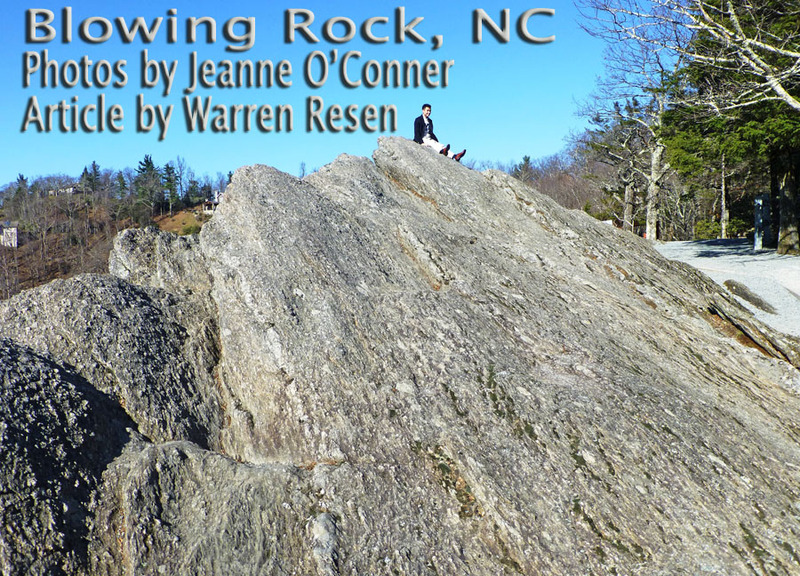 The story behind Blowing Rock's name is based on both a physical feature and local lore. There is an actual rock outcropping on the spot where the legend takes place. I'll leave it up to you to decide which is the most appropriate reason for the name. What follows is a shortened version of the legend. It was told that a Chickasaw maiden took a fancy to a wandering Cherokee brave who returned her flirtatious advances. They became lovers. One day a strange reddening appeared in the sky that drew the lovers up to The Rock. To the brave it was a sign of trouble, commanding him to return to his tribe in the plains. The maiden pleaded with him not to leave her. Torn by conflict between duty and love, he leaped from the highest rock to the wilderness far below. The grief stricken maiden prayed daily to the Great Spirit until one evening a strange reddening again appeared in the sky and a gust of wind blew her lover back onto the The Rock from the valley far below. For Native Americans of the area this was reason enough for the name. Blowing Rock's mysterious winds often caused even the snow to fall upside down from the valley far below the jutting precipice. Why not a brave who was returned to his lover by the Great Spirit? Ripley's Believe-It-Or-Not named this the only place in the world where snow falls upside down…Believe-It-Or-Not. The site of this legend persists today through the marketing efforts of the local community and draws enough visitors to warrant a building housing an information center and gift shop. It is worth a visit just to stand on the spot or after reading the caution signs climb the famous rock. The unrestricted views are stunning with most of the highest peaks in the southern Blue Ridge Mountains in view. To use a line from one of Barbara Streisand's hit songs, "On a clear day you can see forever." This is an area to which residents of the southern states have gravitated for generations to escape the summer heat and humidity down below. At almost 4,000 feet above sea level, with spectacular views of the Blue Ridge Mountains, Blowing Rock continues to be a favorite destination for visitors. Today the Blowing Rock area is a Four Season destination offering year ‘round outdoor activities and those magnificent fall colors that have to be appreciated in person. The vistas are just too vast and colors too intense for a photo to do it justice. Blowing Rock is the total opposite of its sister city Boone to the north with that city's traffic and commercial sprawl. Its main street is rife with every fast food restaurant chain known to man. Blowing Rock has no high rise buildings. Main Street is a delightful collection of individual restaurants, shops, and businesses. The architecture is of different designs and periods making for individuality not look-alike chain motels and restaurants. Surrounding residential areas feature one-of-a-kind residences, many quite impressive. Everything says stability and affluence. 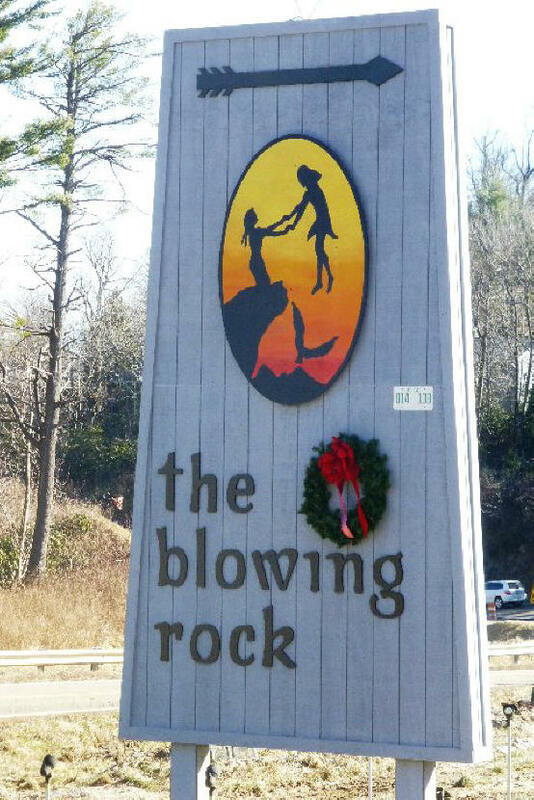 When driving up the mountain on US Hwy 321 to Blowing Rock, the first thing that visitors see is a sign announcing "The Blowing Rock," the formation from where the town gets its name. Directly across the road is the Green Park Inn with its charming 19th century architecture. My stay here was not in one of the newer motels or even in one of the delightful B&B's sprinkled throughout the downtown and surrounding areas but in the Green Park Inn located at the "gateway to the High Country." 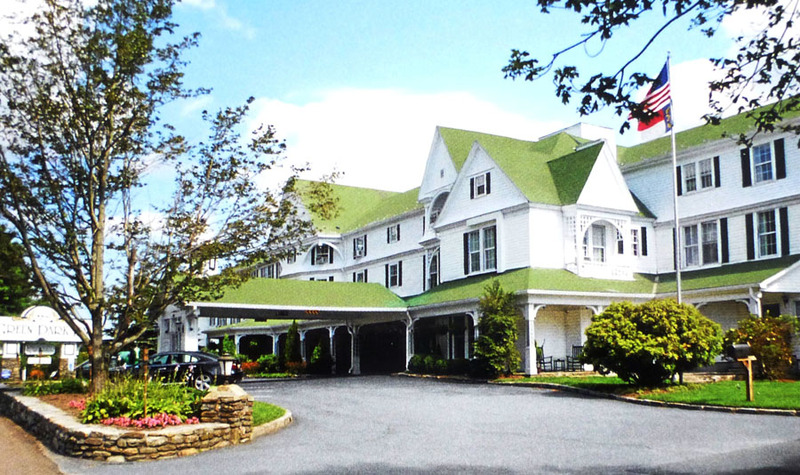 For many years it was considered to be the most luxurious hotel in all of the High Country." Now well into its second century of hosting visitors the Inn, it opened in 1891 more than 125 years ago and is listed on several historical registers and is a member of Historic Hotels of America. In its early days when the rich and famous came to visit this then remote location, it was a different time when the world was a more genteel place. Much of its gentility has been retained. Presidents, Hollywood celebrities and notables, some of whose pictures adorn the walls of its lobby have been guests of the Inn. My favorite is a photo of Annie Oakley. When guests pass though the front doors to the lobby they quickly come to understand the reason why the Green Park Inn's reputation for charm is evident even to this today. The lobby, front desk, library, tea room, crystal chandeliers, furniture and decorating give one the feeling of being in an old mansion of another era. There is no chrome or amplified music but all modern amenities have been installed in public areas and the comfortable guest rooms. The Green Park Inn sits on top of the Eastern Continental Divide making the name of its Divide Tavern very appropriate. On the western side of the Continental Divide water flows west and eventually into the Mississippi River. On the east it eventually reaches the Atlantic Ocean. In this softly lit tavern there are no banks of muted TV's staring down from the walls or loud music. It's a place to meet, relax with a beverage of your choice and engage in conversation. The menu at the Inn's famous Chestnut Grill features its own unique specialties. The atmosphere allows patrons to enjoy dining with no loud background noise or the ubiquitous TV. 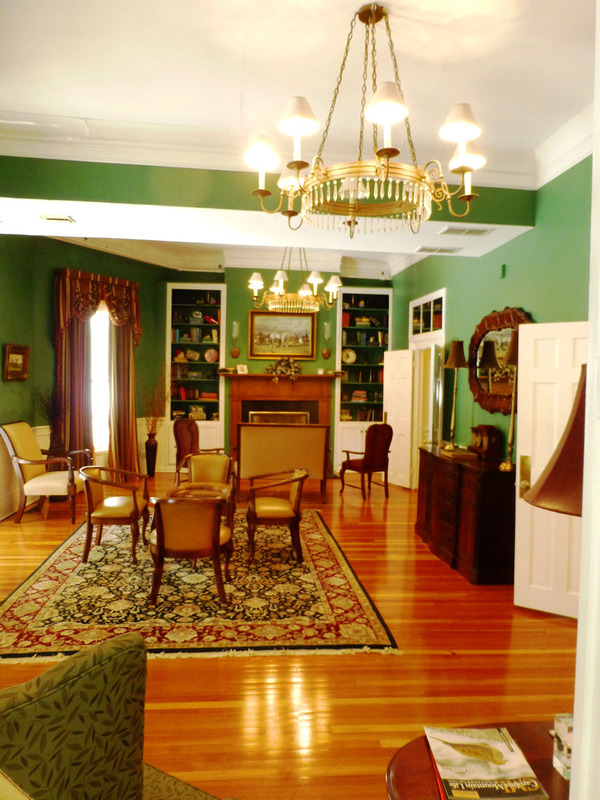 This is a unique 88 room inn with roots stretching back to the late 1800's, back to an era of charm and civility. In no way does it resemble today's look-alike chain hotels or cracker box design mentality. If you want to eat at the same fast food restaurants and stay at the same chain motels you have at home…why travel? Guests are encouraged to spend time in the lobby, library and other public areas where they can meet friendly fellow travelers. 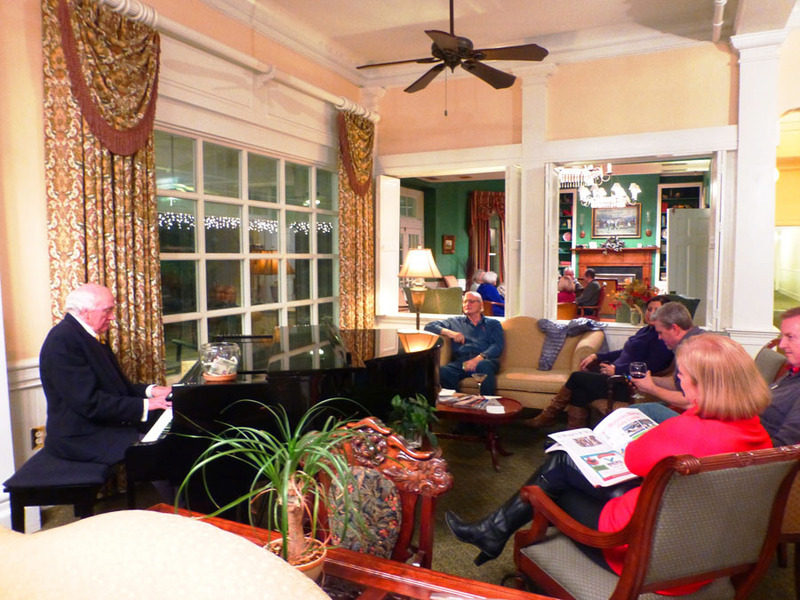 One thing not to miss is the Friday and Saturday evening piano entertainment in the lobby. Local legend, Pianist Charlie Ellis, has been performing in the area and around the country for more than 40 years delighting listeners with his American Song Book collection. Enjoy a couple of hours of easy listening music. If you know the words to his many songs, feel free to sing along. Any time is a good time to visit the historic Green Park Inn. Stop in, stay a while, relax and recharge your batteries. A visit to their web site will start you on your way.